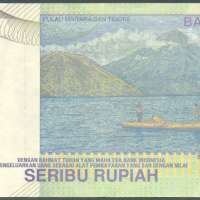 Showing two islands, Maitara and Tidore as well as two fishermen on a boat. Thomas Matulessy (8 June 1783 – 16 December 1817,) also known as Kapitan Pattimura or simply Pattimura, was an Ambonese soldier and National Hero of Indonesia. Born on the island of Saparua, Pattimura joined the British army after they took the Maluku islands from the Dutch colonials. When the islands were returned to the Dutch in 1816, he was dismissed. Concerned that the Dutch would implement programs that limited his people, Pattimura led an armed rebellion that captured Fort Duurstede on 16 May 1817. Killing the inhabitants of the fortress and fighting off Dutch reinforcements, on 29 May he was declared the leader of the Maluku people. After being betrayed by the King of Booi Pati Akoon, he was captured by Dutch forces on 11 November and hanged the next month. Pattimura has become a symbol of both Maluku and Indonesian independence, praised by President Sukarno and declared a national hero by President Suharto. He has several namesakes both in the capital of Maluku, Ambon, and in the rest of the Indonesian archipelago.